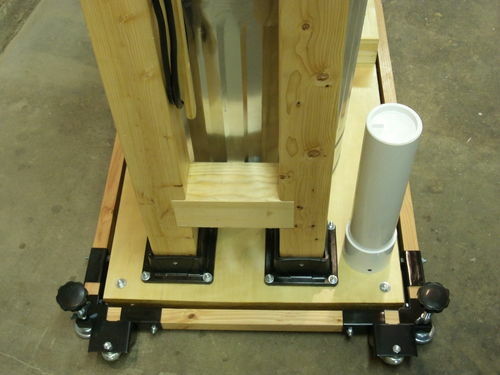 I saw the idea of converting the standard Harbor Freight Dust Collector with a separator and Thien Baffle on a mobile cart here on LJ’s. I want to first begin by thanking Cory and Bert for sharing their ideas and creativity here. These two projects inspired me to make my own version. I used this DC as it came out of the box for a couple months before I decided to make the changes. The original mobile base worked great but added to the height of the collector. My basement workshop has low headroom and the ability to wheel it around was limited with obstructions like lighting, pipes, and duct work. Even though I’m a weekend warrior woodworker, I found the collection bag filled quickly and was cumbersome to remove and put back on. But, overall I thought this dust collector was a definite improvement over using my shop vacuum set up that I’ve been accustomed to and sick of dealing with for so long. One of the priorities in a design change was to have a mobile base that would keep the DC low to the floor. So, where could I go wrong if I used a Harbor Freight Mobile Base for my Harbor Freight Dust Collector? I wanted a separator with a Thien Baffle to the capture the chips and keep most from entering the collector bag. I also wanted to upgrade the 5 micron bag to a Wynn Cartridge Filter to reduce dust in the air and my lungs, and have an added bonus of lowering the height of the collector. And now after a couple more months of use, but this time with the upgrades, I am quite pleased and think this was worth the money and time. This mobile DC will probably remain parked in a corner of my workshop for most of its use, but steers around pretty good clearing all the obstructions as I move it around when I need it to. The motor and impeller housing support post assembly is very solid. 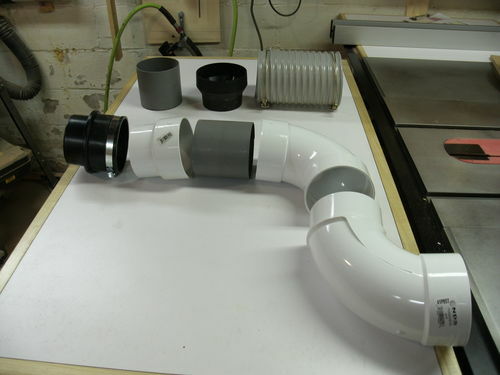 The trash can separator with Thien Baffle performs great. Having the remote is just plain convenient. The Wynn Filter Cartridge improved air quality for the health of the workshop and myself. I did a run of 4” S&D pipe 15 feet long to reach my table saw. But for the other tools, they are on mobile bases as well and I can maneuver them from against the wall to out in the middle of floor and close to the DC. For all that I purchased Rockler Dust Right Fittings for the tools and a long enough Dust Right Hose to reach them. I thought I’d might buy the Dust Right Storage Rack and Floor Sweep Kit but had sticker shock when I seen the amount they added to the bill with all the Dust Right Fittings and Hose. I came up with a cheap alternative using PVC and a hose spring clip to contain the Dust Right Hose and all that is explained in detail in a photo below. And the other cheap alternative that works great is the floor sweep I made up from the wands and floor nozzle I saved from a burned out shop vacuum. I took a 2-1/2” to 4” Dust Right Fitting and fitted to the end of the wand and used a hose spring clip to contain it on the cart. You can see that in the project post photos. I took the provided dimensions of Cory’s and Bert’s mobile carts, the ideas I had, and winged it from there. Pretty straight forward build with everything mechanically fastened with a combination of simple joinery, glue, lag screws, carriage bolts, hex bolts, and screws. I didn’t prep the lumber much at all. At the big box store I sorted through all the crooked until I found nice straight pieces. I did however apply a finish of a home brew wipe on poly. The picture below shows the cart without the separator, hose, and floor sweep for clarity. That short piece of PVC and hose spring clip works great to contain the Dust Right Hose when not in use. 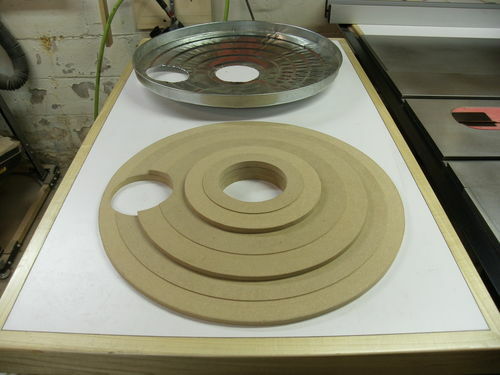 I cut a wooden disc that is the same diameter as the inside of a repair coupling and screwed to the plywood, and then the repair coupling is screwed to the disc. 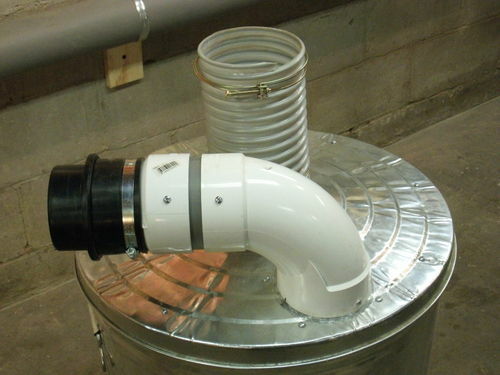 The PVC fits into the coupling and is topped with a knockout cap to keep dust and debris from falling down inside. The Long Range Switch mounted nicely between the 4×4’s with the supplied hardware. The power cord for the Harbor Freight DC tucks away in behind the motor bracket while the Long Range Switch power cord has a cord wrap for when I move the cart around. The picture below shows the Peak Post Anchors. I painted them black. They are mounted to the 4×4’s with supplied hardware and that assembly is secured to the double layer of ¾” plywood with carriage bolts. Also, you can see how I attached the double layer of ¾” plywood to the mobile base. I drilled holes in the metal corners of the mobile base with corresponding holes in the plywood and fastened with hex bolts. You may notice that the post anchors are mounted off center from the cart. This was done to allow room for the 4” Dust Right Hose and the PVC to support it. 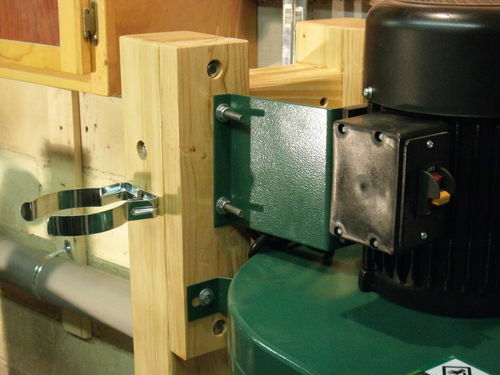 The picture below shows how the DC motor bracket is mounted to the 4×4 posts. There’s spacers between the 4×4’s and the motor mounting bracket. The spacers are 2×4’s planed down to 1-3/8” to align the center of the impeller inlet with the center of the garbage can lid inlet. The spacers are lagged into the 4×4’s. 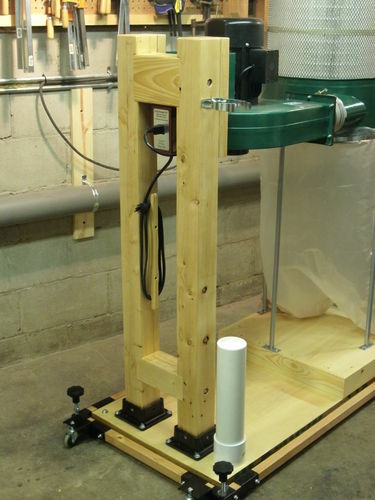 The machine thread to wood thread dowels go through the spacers directly into the 4×4’s. Short lag bolts hold the impeller housing brackets to the spacer. In the picture below shows the riser for the collection bag, donut ring, and Wynn Cartridge Filter. Because I wanted a good amount of clearance for the garbage can separator I needed this riser to raise everything 3-1/4”. The riser is made from 1×4’s with mitered corners. Screw cleats fasten the riser to the cart from the inside and screw cleats fasten the single layer of AC plywood from the outside. Lags were used to fasten the legs. Along with the information I gathered from Cory’s and Bert’s projects, I also found everything I needed to make my version here. This separator with the Thien Baffle performs great and is super easy to access and empty compared to the collection bag. I’ve emptied the trash can a handful of times in the couple months since making the upgrades. With only about a couple cup fulls of dust in the collection bag, I don’t expect to empty it any time soon. I seen performance gains with the new motor and impeller configuration and using the Wynn Cartridge Filter, but most of that was lost when I added the separator. With no way to measure this accurately, I will play it safe and say the collector performance gains and loses factored together is about a wash. From what I’ve read, my situation is par with others who did the same type of upgrade. In the two photos below you can see what I did to get started. After cutting 4” holes the integrity of the garbage can lid weakened, so I beefed it up with a MDF insert. The insert fits the contour and recessed nicely in the lid. The insert is fastened to the lid with Quick Grab adhesive and pan head screws. 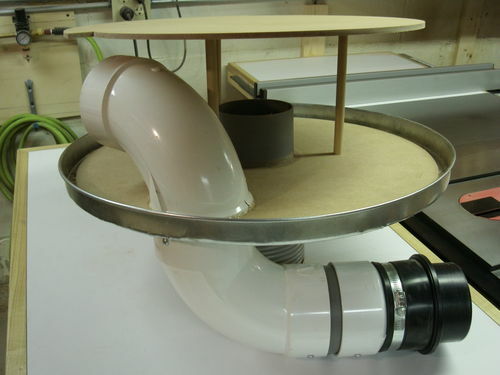 While it adds a little weight, it is really ridged and provided a flat surface to mount the elbow and Thien Baffle. I didn’t want a sharp bend in the Dust Right Hose as seen with Cory’s and Bert’s versions. In the photo below shows that I chose to build the separator with 2 opposing elbows. I used a street elbow down inside the can. The “shoulder” of the street elbow rests in a bead of silicone on the MDF insert as it passes through the opening. The elbow on top is a standard elbow that I scribed and cut to fit the contour of the lid. I secured it with a pan head screw and ran a bead of silicon sealing it to the lid. The 5” to 4” reducer didn’t extend into the center area of the baffle far enough. I read on the Thien website that this inlet needs to extend into the baffle area by a ratio of ½ the diameter of the elbow. The photo below shows I extended this to two inches using a 4” long piece of S&D pipe. 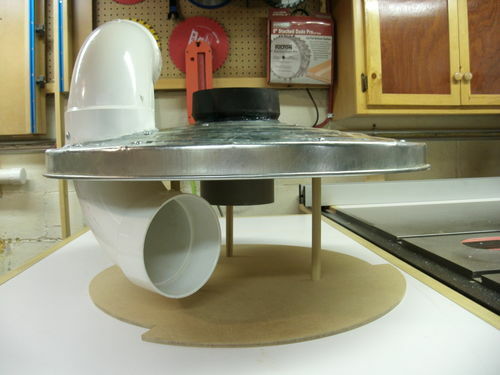 I first fit the reducer into the opening in the garbage can lid and tacked it into place with hot melt glue. I then put a bead of silicon on the rim on one end of the S&D, flipped the garbage can lid over to fit the S&D through the opening in the MDF insert and into the reducer to adhere the two together. 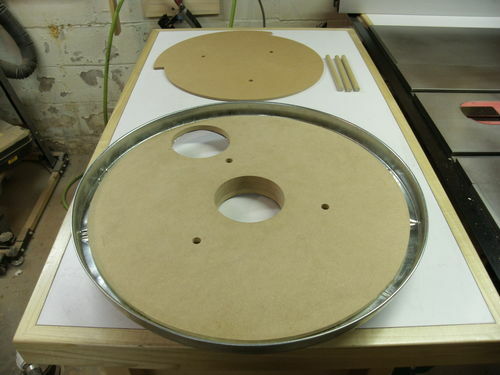 And finally, I ran a bead of silicon to seal the S&D to the MDF insert and the reducer to the garbage can lid. 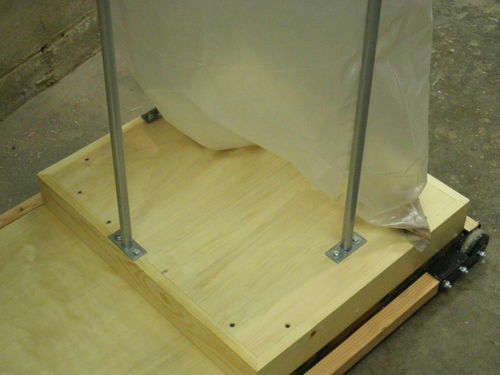 The Thien Baffle secures to the MDF insert with ½” dowels. The dowels connect into holes in the insert and baffle with glue. Before I just grabbed a drill and drilled the holes with a ½” bit I found that the dowel from the big box store was slightly undersized. I drilled a test hole on scrap with a 15/32nd drill bit and it was a perfect size for a tight fit. The large diameter of the baffle begins just behind the end of the street elbow. There is about 1” clearance in between the bottom of the street elbow and the baffle so chips can pass underneath without issue. In the picture below, going left to right, shows the connection of the Dust Right Hose to the separator. First is a Dust Right Swivel connected to a 3” DWV to 4” S&D adapter. Connecting the adapter to the elbow is a piece of S&D pipe cut 4” long. The fittings are secured with screws and a hose clamp. The 5” hose that connects to the impeller is a piece I cut from the hose that came with the Harbor Freight collector. I swapped out the hose clamps that came with the collector with better ones. In the photo below is all the fitting I needed to put this all together. Great job, the deails and Pictures is outstanding thanks for sharing. I did a similar seperation a few years back,Only way to go. Outstanding write-up and photos thanks for posting! Wildwood...thanks for the compliment ! Beautiful work on that. I used the same Harbor Freight collector for my custom collection project 6 months ago. For my blast gates, ducts, collector, Highland filter, separator, etc, my total cost was about $850, not bad for a complete system. My only regret is that I didn’t make mine look as nice as yours. If you ever decide to run permanent ductwork, I’d highly recommend the Long Ranger remote blast gates; they’re fantastic. Awesome! great work! I really need to make one of these! Wow that is one nice looking setup with a lot of nice construction detail ideas . Nice to see the combination of parts that you used on this should give others some help in building theirs . I have that dust collector and the Wynn filter. I put a baffle in the housing the filters are attached to and it works pretty well. I’d like to upgrade to a set up like yours and think I will in the future sometime. Thanks for taking the time to document all the info. Sure makes my life easier. Awesome write-up. We all really appreciate the time and effort put into these instructionals. This is really turning into a fad! In a great way! I think it is awesome that so many LJ’s have pooled their efforts and knowledge to come up with a safe and cheap way to clear the air in the shop. I really need to jump on this soon. Cleaned out my unisaw the other day and it was frightening. All the more reason to get going on this!!! Great write up. Thanks for sharing. When I get my building put up, some version of this will be a must have for me. Thanks for sharing. I’ve got a Grizzly DC that’s similar. I’ll have to save this write up and try it out at a later date. Fantastic build and a very detailed write up. Thank you!! Probably the most thorough write up I’ve seen for this. Bravo. First class job, and fantastic description of how you did it!